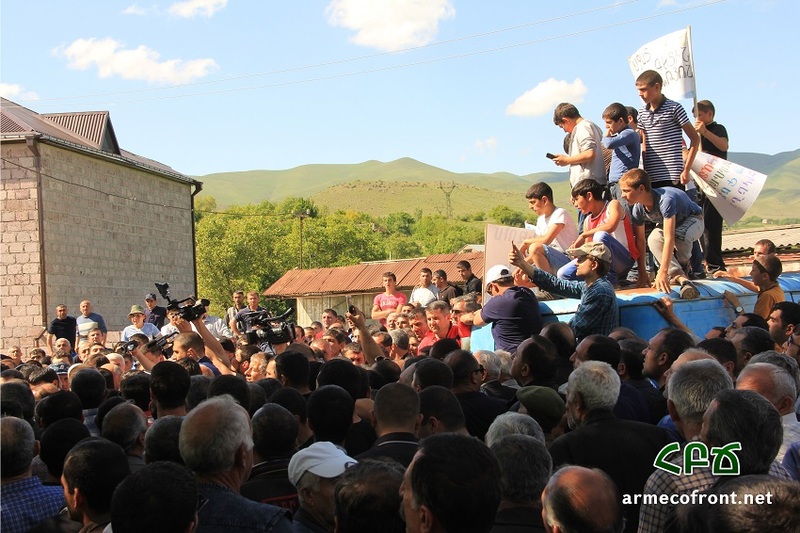 Meanwhile, as the residents, civil society groups as well as environmentalists continued their resentment to these projects, there have been cases of threats to the residents in Garni. In 2013 World Bank provided around 30 million USD as a loan to Republic of Armenia for improving its irrigation systems. The loan was provided under the condition to repay it within 30 years. The Armenian government in its turn plans to contribute with 7.5 million USD. The project is planned to be realized within 4 years in 4 locations (Meghri, Geghardalich, Baghramyan-Norakert and Kaghtsrashen) where the mechanical irrigation system will be replaced with gravity (self-flowing) irrigation systems. The government hopes that this replacement will minimize the loss of water during the irrigation as a result of worn-out pipes, as well as save money from the cuts in electricity usage that operate the mechanical pumps. These projects have not been unanimously welcomed by the locals. One of the villages that opposes the irrigation project for the second year in a row is Garni. They are joined by the residents from Goght village. The gravity irrigation system project (named Kaghtsrashen) is planned to be built on Azat river near Garni and will provide water to 12 villages further in Ararat region (overall 1232ha). In the past (and till the present) the villages in Ararat used to receive their water from Azat reservoir that was filled with waters from Azat river. However, this system operates through pumps running on electricity, so the government considers it expensive. To save money, as well as to avoid unexpected interruptions of water supply to the villagers due to electricity cuts, the government regards the gravity irrigation system as the optimal choice. Instead, it plans to invest the saved money, around 500 million AMD (~1 millon USD) annually, in the development of the local communities and tourism sector. For example, it plans to invest 600 millon AMD to renovate Garni’s main irrigation canal and its water network which is believed to reduce the loss of 35% of water. There will also be investments for renovating the road starting from Garni pagan temple to the stone-symphony (natural monument), which will then be illuminated, info-stands will be in place, cultural events will be organized, all aimed at boosting tourism industry, according to the state plans. So for realizing the irrigation project, a dam is planned to be built on Azat river (its name by the way is translated as Free) 9-10 km further up from Azat reservoir, with around 28 km pipes that will take the water from the river to 12 villages in Ararat region. The State Committee on Water System (SCWS) assures that Garni residents will in their turn take as much water from the river for the irrigation of their own lands as they did previously. In addition, the SCWS claims that there will be water flow left in the river for not damaging the ecosystem of the area (some 850liter/second). It claims that all its calculations were carried out taking into account water scarce years and that even in such years there will be enough water flow for environmental purposes, for irrigation in Garni, as well as for the abovementioned 12 villages. Additionally, the government has a plan B in case the season is dry and there is little water in the river: it will keep the electricity-run pumps that will continue pulling the water from Azat reservoir, as it has been done before. In the future, however, the pumps are planned to be replaced by drip irrigation system that will reduce 50% of water usage (one may wonder why not now?). There are also promises on behalf of the state bodies that no rare tree or fish species will be affected as a result of this water transfer project. It confirms that the project has gone through all sorts of environmental assessments, many public hearings were organized, the project underwent all types of expertise and got approved (official plan in Armenian: here). But here is the first misinformation. There have indeed been many hearings however, the residents in Garni and neighbouring Goght have opposed the project numerous times (including the project of Geghardalich with similar fate for Karmir and Goght rivers). They have collected signatures against these projects and even closed the road to Garni-Geghard a few times as a sign of resentment to the construction activities. Yet the state has turned a deaf ear and has continued the projects’ implementation. The reasons for such opposition are numerous; one of them are the dry summers in Armenia which result in little water flow in the river (usually it happens every summer and beginning of autumn). Lack of water will completely deprive the villages from irrigation from June till October. In the past 7-8 years the natural flow in the river has decreased due to climate change (evaporation as a result of global warming), as well as hydropower plants built on it. Meanwhile this river not only irrigates the lands of the villagers in Garni, but also the lands of neighbouring villages Goght, Geghard; it also provides drinking water to Yerevan (~ 1560litre/second), Artashat and a few more locations. As a result of little flow in Azat river, Azat reservoir will also dry out, which in its turn feeds villages located further. But the project has no mention of any effect of the program on other villages that use the reservoir, as well as there is no risk assessment for the reservoir itself. So the second misinformation or rather dilemma is how the state plans to use the water from reservoir (government’s plan B), if it dries out. For the past three years it has already been registered that water level in Azat reservoir has gone down. It is thus clear that further cuts of water in the river will decrease water in reservoir. Thus neither the villages nearby will access it to the full, nor the plan B will work out. In addition, measurements in July and August 2015 have proved that there is not enough water in the river itself to meet the demand of the law for environmental flow of 850litres/second, at the same time providing 200-900litres/second for the gravity irrigation system, not to mention those who will irrigate their lands down the river. So here is another dilemma: if there will be not enough water in the river, who will the authorities prioritize - Garni residents or 12 other villages? And how is this prioritization going to be assessed and controlled? The Garni residents fear that they will be the ones to pay the price, since according to the project (page 30), two villages alone out of 12 have around 750ha of land out of the 1232 ha, where the prime minister of the Republic of Armenia as well as a few current and former officials are reported to own big portions of land. Geghardalich project is also reported to serve the needs of another official – Chairman of the Control Chamber of the Republic of Armenia. So there is little doubt over the prioritization, if the decision makers are the ones who will be the beneficiaries. The absurdity of the prioritization becomes more visible once one compares the amount of hectares of land that is planned to irrigate in Ararat region. There is around 854ha and additionally another 378ha of land in need of irrigation in Ararat region. In Garni there is 600 ha of land in need of irrigation and additional 600 hectares (according to state numbers - only 280 hecaters) of arable land that have remained without cultivation due to lack of water. Thus the villagers are trying to grasp the prioritization mechanisms which potentially threaten the existence of agriculture in Garni and neighbouring villages, which is their means of survival. Other concerns of Garni residents, as well as environmentalists are the animal and plant species that will be damaged as a result of this project. Garni is located on a desert and semi-desert landscape, where some of the plant species are registered in the Red Book of Armenia (i.e. at the verge of extinction). In addition there are 250 animal species, including several fish species in the river itself. The lack of water is not only a risk of complete desertification of the area, but also a threat to the plant and animal species, of which only a few are mentioned in the project. The authors of the project deny the existence of the rest of the species nearby. Therefore they see no need to include the risks to these species in the project. Additionally there is no mention in the project as to how many trees will be cut. Moreover, the river is the natural border of Khosrov forest state reserve, which according to environmentalists and residents will be negatively impacted as a result of little or no water flow in the river. The environmentalists and residents also fear the pollution of the river with the construction waste caused by the project implementation. Based on the request of the civil society, residents of Garni, Goght villages and environmentalists, the Armenian office of World Bank organized a meeting in March 2016, during which the civil society raised its concerns over the project. They also suggested the authors of the project as well as World Bank to look for renewable options for the operation of irrigation systems that would be less harmful for the environment and communities, such as operation of the pumps with solar panels or construction of additional reservoirs near Araks river. However, World Bank noted that these alternative projects would need bigger loans which Armenia cannot afford. The civil society also expressed its opinion that if the environmental impact assessment of the abovementioned irrigation projects were carried out in accordance with the World Bank standards and Armenia’s geographical and hydro-meteorological peculiarities, the projects might have less dire effects on the ecosystem and communities. As one concludes, Bank’s head office in its turn has little concern over the impacts of the projects it funds, possibly leaving it up to governments (no matter how corrupt) to prioritize projects unfavourable for the society and environment. Meanwhile, as the residents, civil society groups as well as environmentalists continued their resentment to these projects, there have been cases of threats to the residents in Garni. Unidentified individuals visited the residents, verbally assaulted them and threatened their relatives. In one scenario they have even threatened one of the residents to take her son to army (despite the fact that he had already served in the army), particularly to Karabakh conflict zone. Taking into consideration the continuous opposition to the abovementioned projects, the best the World Bank could do was to either withdraw its loans or support irrigation projects with renewable technologies in place. However, after two days of yet another strike and closure of the Garni-Geghard road on May 20-21st, the prime minister of Armenia himself visited the protesters in an attempt to save the face of its apparatus, as well as of the World Bank. First he declared he was not aware of the issue. So after the protesters enlightened him, he declared about the annulment of the project. Not only this way of decision making was absurd, but also there was and is little trust towards him and the state apparatus, which in the past years has spared no effort to abuse the trust of the society in numerous cases. In the past there were projects (maternity benefit cuts, gentrification projects) which were suspended only to be resumed in 3-4 years. Therefore, there needs to be not just a verbal annulment of the project, but presentation and realization of new projects which will be environmentally sustainable and community not oligarchy oriented. To ensure this, World Bank too needs to avoid engaging in projects which among other international norms draw violations of human rights. In the abovementioned projects there have been risks of discrimination based on social origin (ICCPR, Article 26) as the prioritization mechanism of lands in Ararat region over lands in Garni were unjustified; the right to take part in the conduct of public affairs was also restrained (ICCPR, Article 25) as the residents were threatened for their active opposition of the projects. Implementation of these projects would also diminish the right of residents in Garni, Goght and nearby villages to an adequate standard of living for themselves and their families (ICESCR, Article 11) and their right to work (ICESCR, Article 6), since everyone who uses the water from Azat river and Azat reservoir would be eventually deprived of water and thus the opportunity to cultivate their lands and gain their living by agriculture (since even if the water networks are renovated, the lack of water will make them useless). Thus, by funding similar projects which have no intention to bring renewable technologies anywhere near to developing countries such as Armenia, World Bank does little favor to Armenia’s environment, local communities and their rights. Moreover, it undermines Armenia’s precarious state of democracy, fosters corruption and tarnishes Bank’s own reputation.